There’s a new…I mean old…no, new bourbon in town. 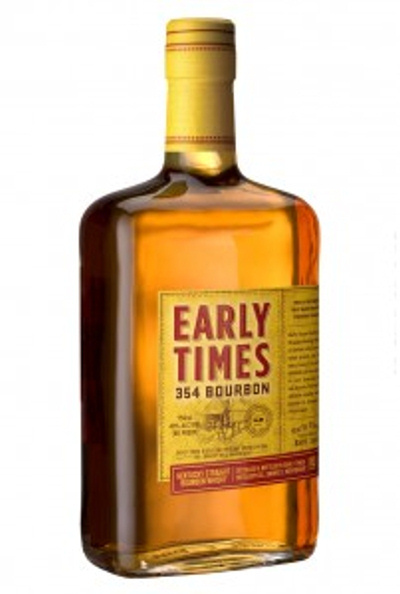 Early times a brand owned by Brown Forman is re-entering the bourbon market. Probably best known as the distiller of Jack Daniels Tennessee Whiskey Brown Forman also distills quite a lot of other spirits, including Early Times Kentucky Whiskey. Early Times has been part of the Brown Forman portfolio since they purchased the company back in 1923. In the 1950s Early Times was the best selling Kentucky Straight Bourbon Whiskey in the world. Things being what they are the world shifted around and thoughts followed and in 1983 Brown forman decided to abandon the Bourbon brand and instead give themselves the latitude to age their whiskey in part in used barrels to produce a mellower product that the market might embrace. First they are trying to compete directly with Jim Beam White Label. Beam has had a corner on the big bourbon market for decades. I’m not saying this shouldn’t be a goal to be competitive, but they even went to the extent of doing blind taste tests to “prove” that their whiskey was superior. If this is their target it will take them decades to dethrone Beam, and I’m pretty sure it won’t happen. Plus Beam White Label isn’t that good as far as bourbon goes. Sure it is better in a pinch of you are drinking well drinks or at a wedding, but it isn’t a go to for the aficionado. Its 80 proof. Wawah! Yes they make this entry into the “Barely Bourbon” category. If you will recall on my “Whiskey Purchase: A Buyer’s Guide” The first rule is always buy a whiskey that is over 80 proof. This is because You need to get into the 86-90 proof range for the flavor to really be released. I remembered I compared Alcohol to Salt in whiskey where the right amount releases flavors that were understated without the salt. Same for bourbon, you need enough alcohol to really accentuate the flavor, and in my experience 80 proof doesn’t get it done.